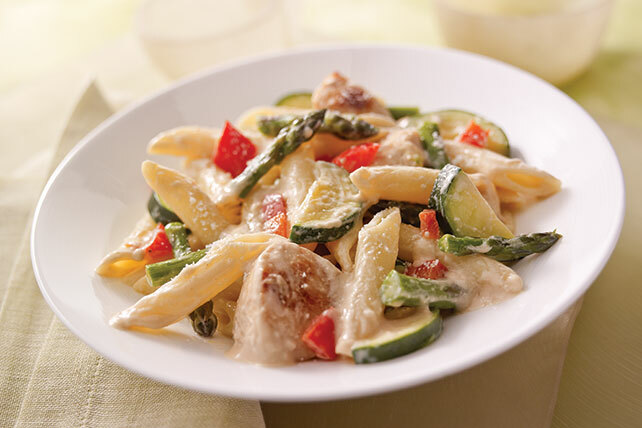 Follow this Creamy Chicken Penne with Veggies recipe! Combine crunchy veggies and garlic in a rich-tasting sauce for an unforgettable pasta dish! Cook pasta as directed on package, omitting salt. Meanwhile, heat oil in large skillet on medium heat. Add chicken and onions; cook 5 min. or until chicken is done, stirring frequently. Add asparagus, zucchini, peppers and garlic; cook and stir 2 to 3 min. or until vegetables are crisp-tender. Remove from heat; cover to keep warm. Melt butter in medium saucepan on medium heat. Stir in flour until blended. Gradually stir in milk. Bring to boil; cook 2 min. or until thickened, stirring constantly. Add cream cheese and Romano; cook and stir 1 to 2 min. or until cream cheese is completely melted and sauce is well blended. Drain pasta; place in large bowl. Add chicken mixture and cream cheese sauce; mix lightly. Sprinkle with parsley. Omit chicken. Prepare recipe as directed, cooking onions with the remaining vegetables until crisp-tender. Remove from heat. Prepare the cream cheese sauce and continue as directed. Prepare using whatever vegetables you have on hand. Another great vegetable combination is sugar snap pea, or snow peas, and carrots.